I agree with Le Peche. No need to work there to realize that Briffard hasn't had his "coudées franches", i.e. complete freedom of action and creation, at Le Cinq with the team as he found it. He among other things also needs a much better pastry unit. But it is actually the whole crew that needs to work in unisson to help showcase Eric Briffard's unique talent. He cannot quite appear as the great chef he is if things remain as they have been until recently. As a fairly regular client since Briffard came in, I can testify that the restaurant has only been getting better and better since Briffard took over. While I had some disapointing meals Briffard was out last winter, and even some disapointing plates when he was in (but then I complained and it got fixed), it hasn't happened since the spring -- the level of the food there has been getting closer to what it was at les Elysées (i.e. just top notch), including on the few occasions when Briffard was out. The only exception of course if the pastry department, and we hope the pastry chef leaves soon too. As far as I'm concerned, I hope Briffard gets more control and more staff goes. As for consistency, Le Peche is right of course -- I know of no palace escaping this problem, and as he points out, it becomes more of an issue because of the complexity and subtlety of Briffard's art. I just had one of the most perfect meals of my life at le Cinq, and it was the 78€ lunch deal -- it was the first time I found the Le Cinq expérience superior to what les Elysées was when Briffard was there. In fact, it compares with my Lucas-Carton and Bernard Loiseau memories. Highlights included razor clams with ginger, seaweed butter, spinach, tomato, almonds and, I'm sure, many other things. The most unique thing about Briffard is how incredibly complex his recipes are but how simple they taste. Litteraly tens of ingredients are mobilized, but they're just here to magnify the excellence of the main ingredient. The same was true about an awesome course of gigantic scallops, intensely sweet and tasty, with all sort of little goodies on top like small grey shrimps, raisins, shaved clams... On the side was a cylinder of marinated cauliflower, and also an endive caramelised with orange juice. This brought back memories of Loiseau's scallops, when he was on top of his game. The main was tête de veau sauce tortue, with a fried egg (and also some brain on the side), and it was sooo simply perfect (though, there again, it's probably as simple as twelve ingredients). As usual, desserts were good but uninteresting, unexciting, classic -- skip them and join my campaign for letting Briffard take over the pastry department. Will/does he have lievre a la royale on the menu? He has lièvre on the menu, I'm not sure that he'll have it à la Royale, and when I had it last year, it was good not great. I'd focus on Fréchon, Senderens and Besson for Lièvre à la Royale. After having read quite a bit of positive stuff on Briffard, I'm considering going in January. As I'm likely to go alone, I'd like to know if you can order the game pithiviers also for one, or if they do it only for two and more? Also, does that have to be pre-ordered? I'm not sure he'll still do the Pithiviers in January. Best thing is to call them and ask. While I suppose you could order it for one, they might charge you for the full thing (unless you actually get a part from someone's else). Thanks, I sent them a mail, and they said that it wouldn't be a problem. Well, it might happen. If I go, what other things are outstanding? Many thing are, but going ALC adds up pretty quickly. I would not. But since you asked: the white truffle dish, the razor clams, the scallops, the abalone, the pig, the lamb, the raw foie gras, the rognon de veau, anything with puff pastry. Skip desserts. 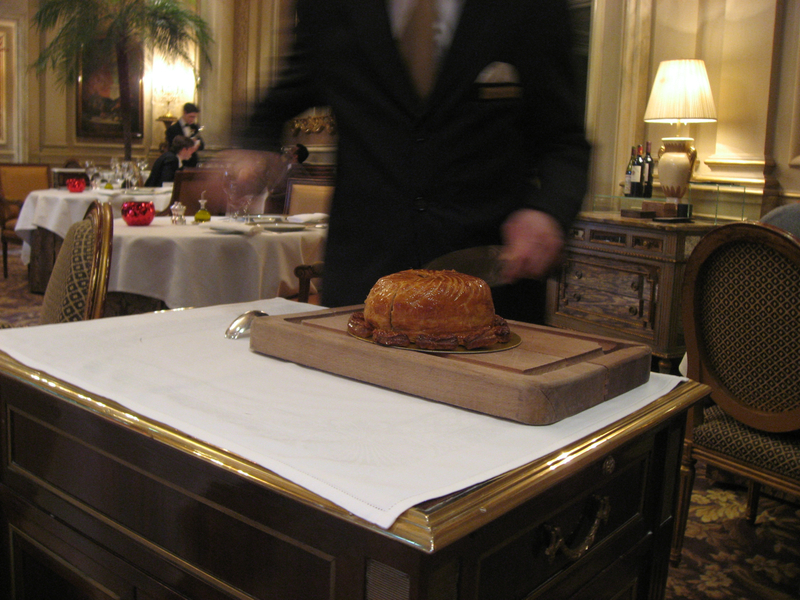 Apparently, you can fit the Pithivier in the menu, with a small extra charge. However, as I believe it's a two-service dish, I don't know yet if they would replace two courses from the menu or just one. Well, I'm going and they are going to do it for one person, which is good news. Can't wait to discover it. It looks just too good to be true. If I remember correctly I had it as part of a menu and it was only one course. They bring the whole "pie" to the table and cut a very healthy slice, what happens to the rest I don't know, as every other table that ordered it received a fresh uncut one. It was so good I suspect I could have finished the leftovers from my table as well as all the others in the restaurant. yes, most of the stuff I read about it mentioned it as being one service. However, some have asked and received a second helping, which explains the disappearance of the little things. Last we were, we did have it in two services -- cause we asked (insisted?). But instead of bringing the rest of the same pie, they brought a brand new one, arguing that the rest of our first one had waited too long. They would never tell me what they really used it for. Phild, these pictures are quite delicious, do you some of the other courses you ate there? It makes it even more interesting. Back from a dinner at Le Cinq. We had the seasonal menu plus the pithiviers. Everything was absolutely perfect, and not that expensive, given the amount of food and wine we had. Turns out they do offer a lievre a la royale-esque dish, or at least did on last week's lunch menu. Quite delectable. Have never had LALR before, so cannot compare it to other versions, but there was no sauce on my plate when I was finished. Will also post this in the LALR section. I believe that's the hare dish they had last year. Julot has posted a photo of it, up there in this thread. It's good, but nothing like a good lièvre à la royale can be. I remember something less gamey, less rich than that. I've got a lunch reservation this friday; will they still serve the Fall menu ? and, for lunch, do I need a tie to go with the nice shirt and nice jacket (and nice pants and shoes/boots) ? I'd love not to have to buy one. The fall menu was last served on Dec. 17, it's now the winter menu. I remember it having some truffle, foie gras, maybe scallops... it looked good. For men, the only requirement is to wear a jacket. You don't even have to bring your own, as they'll provide you with one if need be. That said, it may be more comfortable to wear you own. The tie is not mandatory at all. Le Cinq (Avenue George V) After my lunch with my parents @ Spoons, we walked around the corner and came back at the George V hotel; so I decided to take my chance and asked for a reservation for lunch on friday, I half expected them to be full, but hey!, they had a place for me. I was feeling good, and wanted to experience it all, I ordered the winter menu, I felt that the lunch special was good enough for a business lunch, but not for a christmas gift from me to me. As soon as that was done, the Champagne trolley rolled my way, and I cannot say no to Champagne! and what goes well with Champagne? fry stuff, and in particular a nice portion of very fluffy fried calamari!! I could have only ordered that and be happy! After reading and drooling over the wine list, and an interresting discussion with the sommelier, I ordered wine, 1 1/2 bottle of Meursault "Les Criots" and 1 1/2 bottle of Cornas 2003; the white was perfect both on the nose, in the mouth and with the food; the red was a little to much 2003 (very hot summer), and since it came in late in the lunch ( I was already full and quite happy!) (that was the only "minus" of the whole experience BTW, and knowing that, I would have been better to order a full bottle of the Meursault, even if it was probably the best match for one of the "course". First course; Razor clam with a butter sauce with seaweed, very wintery, but light at the same time; surprisingly spanish in preparation. and in influence, impressive start! - "salad" of multicolored beets and other roots vegetables with black truffles and foie gras. Interresting combination, from the freshness of the veggies to the sumptuousness of the foie gras to the earthiness of the truffles, you could taste it all, either individually or combined. - Truffle brioche, again, the aroma was so intense that I could have eaten this all day and night! St-Jacques (scallops) with a hazelnut and chestnut sauce, served with a small "dumpling" containing a nice shrimp, and a side of winter veggies (including crosnes aka Chinese artichoke); in all this trip in Paris, I was surprised at the combination of seafood ingredients and more earthy ingredients like mushrooms (see Spoons) and in that case, nuts; Chestnuts are very winter and that all go very well in that dish! - Pigeon with foie gras in a "cereal crust"; a new twist on the beef wellington, with a very nicelly cooked pigeon in a crust, I can see how hard to have all of this prepared assembled and cooked to perfection! - Pannacota with a mango mousse, very light and refreshing and a nice pause after quite a large amount of food before the dessert! - Chocolate "mousse" with hazenuts, puffed rice and a very nice lemon sorbet with some eadible gold leaves! how luxurious is that considering the price of gold these days! Unfortunatly, I'm not much of a dessert guy! but it was very good! - Swapped coffee with a very nice "thyme" infusion to go with the sweets, I chose a couple of Cannelés because I love them so much! but that that point it was more because of sheer glutonny!!! and I loved it all! I short, one of the most luxurious experience of my life! service was excellent, friendly and attentive, the food was brilliant (and in quantity!)! I've been fully truffled! price wise, yeah, is expensive, but considering all that you get, it's not a rip-off. YOu won't need a tie, and you most certainly won't get the fall menu. THey had a different one, when I went 2 weeks ago. That means no Pithiviers, but possibly a magical pig's trotters and ears dish. 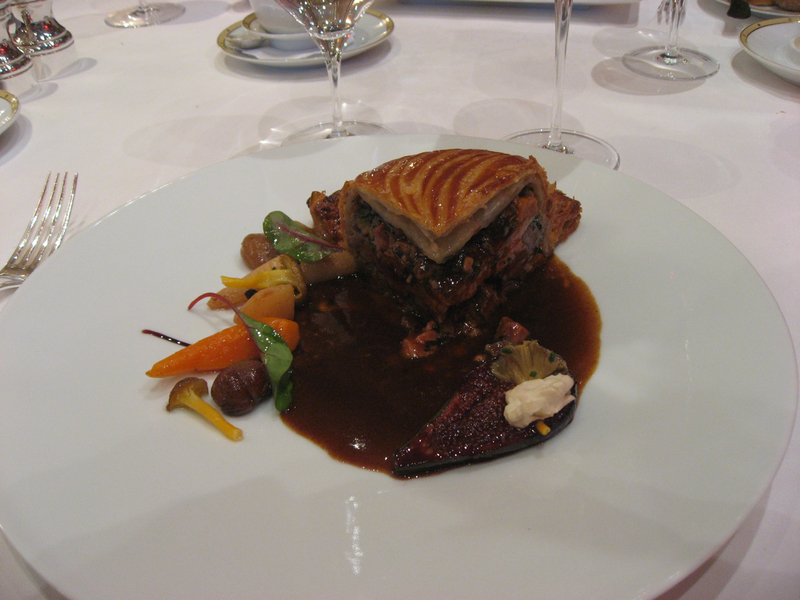 From a meal a couple of weeks ago at Le Cinq, I was left with mixed feelings. On the one hand, Briffard did some incredibly tasty food, like the pig's trotters, ears and foie gras "tartine", and the mignardises, but on the other hand, the main, amuses, and a little intermezzo weren't all that memorable. 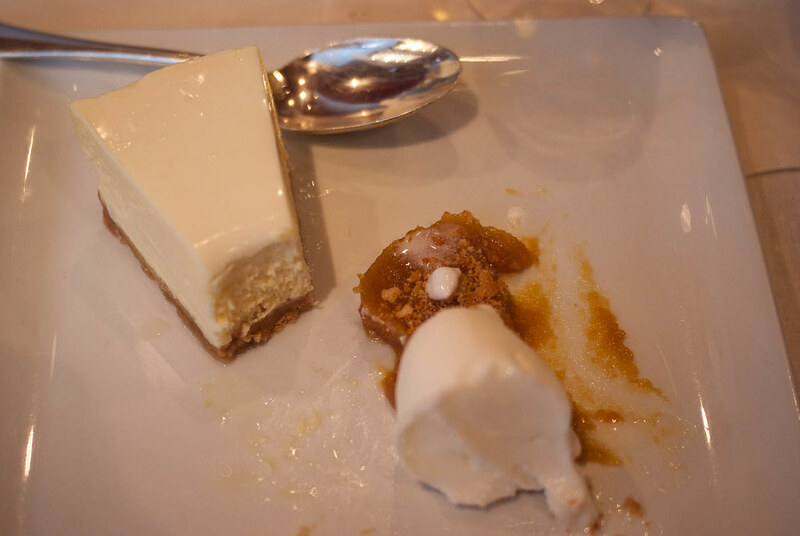 The dessert itself was good, but not much more, and I thought that one will maybe have to give him a little more time, or let him fine tune his dishes for a littler longer to see real 3* food. I was only on the lunch menu, which probably changes the perspective quite a bit, but the general aspects of the cooking were very present even on this budget version. THis being said, I will certainly return here more or less soon, to try the other options. A few of the dishes really do make me want to come back. Felix, that echoes our meal. Generally very good with some highly memorable dishes, but one or two howlers. As an example an eel and potato dish simply didn't work. That said I would happily return for many of the other dishes we ate, my partners medley of mushrooms was very good.